The two discussed Justice League, but also dove into the ongoing revelations of sexual harassment in Hollywood. By Abigail Freeman·	 11/17/2017, 11:13 a.m.
Late night interviews often involve funny stories about filming a movie, but in the current news cycle, some heavier topics end up being discussed. Such was the case with Ben Affleck’s appearance on the Late Show with Stephen Colbert last night. Though the duo started off with some talk about the new Justice League movie coming out, they segued into a more serious conversation later. Specifically, the fact that embattled producer Harvey Weinstein, accused of decades of sexual harassment and assault, gave Affleck his big break by producing Good Will Hunting, as well as Chasing Amy. 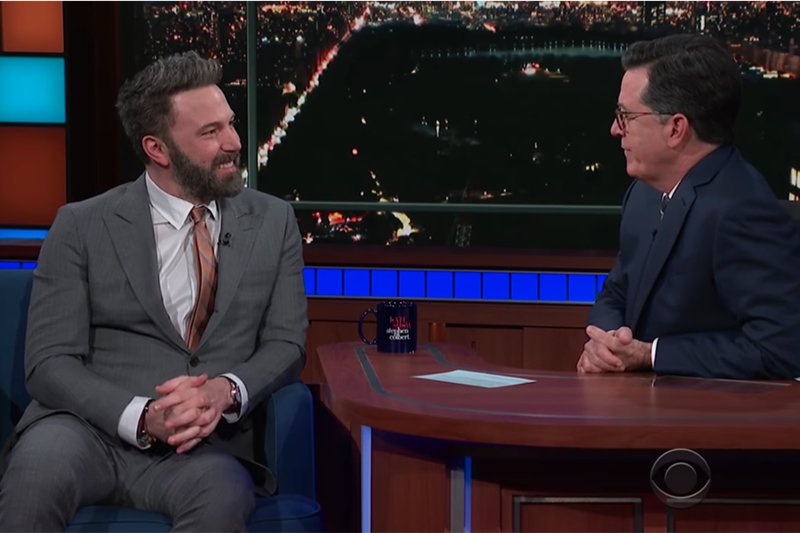 Though Affleck at first demurred, joking to Colbert, “This is a comedy show, correct?” he did address the topic, admitting that it was hard to accept that movies that had made his career had come from Weinstein. But Colbert pushed a little further, pointing out that Affleck himself had been accused of some inappropriate behavior. “If I was ever part of the problem, I want to change,” said Affleck, saying that while he didn’t specifically remember the incidents, he thought it was important to listen to women. The subject came up in part because this year is the 20th anniversary of Good Will Hunting coming out, and Affleck seems to have a sense of humor about his earlier writing efforts now, joking about the real motivations behind the screenplay he co-wrote with Matt Damon. “The idea wasn’t really to express ourselves as writers, it was to write something that we would look cool in as actors,” he explained. Affleck now has plenty of experience looking cool as an actor, of course, given that he’s now played Batman a couple of times, and played Daredevil in an earlier movie. And he admitted to Colbert that he once played Superman in a home movie in high school. Naturally, he thought he could give Henry Cavill, who plays Superman in Justice League, a few tips by showing him the tape. Affleck’s five-year-old son, Sam, is a superhero fan, as well. In fact, Affleck told Colbert he wanted to dress up as Flash for Halloween. Although Sam wasn’t interested in dressing up as Batman, Affleck couldn’t help taking a souvenir from set. Warner Bros. noticed the batarang went missing, though. “Turns out batarangs aren’t cheap,” he admitted ruefully. See Affleck as Batman in Justice League, which opens in theaters today. And regardless of how it’s reviewed, he’s still got a vote of confidence from the president. Watch both videos below, to see Affleck’s thoughts about harassment in Hollywood.